In 1998 an expansion joint fell through the roof at Yankee Stadium, causing the Yankees to move a game with the Angels to Shea Stadium. As Hurricane Irma continues its path of destruction through Florida, the state's two major league baseball teams—like millions of its residents—have left the state. The Miami Marlins are off on Monday and will start a series against the Phillies in Philadelphia on Tuesday. The Tampa Bay Rays were supposed to be playing the Yankees at Tropicana Field in St. Petersburg, but last week MLB moved the series to New York's Citi Field, home of the Mets. Just a few weeks ago, to significantly more controversy, the Houston Astros played at the Trop against the Texas Rangers after having been displaced by Hurricane Harvey, when the two in-state rivals couldn't come to an agreement about playing the game in Texas. This decision made perfect sense, and will allow the Rays to be the home team while the Yankees, despite playing in their city and less than two miles from their ballpark, will be the road team. This is hardly the first time the Yankees have played at a ballpark the Mets called home. The Mets first stadium was the Polo Grounds, where the Yankees had played from 1913 to 1922 as tenants of the New York Giants, before moving to a new ballpark in the Bronx. The Yankees played six World Series in the Polo Grounds, losing to the Giants in 1921 and '22 and beating them in '23, '36, '37 and '51. In 1964, the Mets moved to Shea Stadium, and when the Yankees needed to renovate 50-year-old Yankee Stadium after the 1973 season, they moved to Queens for two years. In '74 they won 89 games and finished two games out in the AL East; in '75 they fell back to 83 wins and a third-place finish, but they had laid the groundwork for teams that would win three pennants and two World Series titles in their first three seasons back in the Bronx. The advent of interleague play in 1997 has made Yankees' trips to Queens an annual occurrence. And in 2000 the Bronx Bombers beat the Mets in a five-game World Series, the first Subway Series in the Fall Classic since 1956. However, that still leaves one game that the Yankees have played at the Mets' stadium that was not expected. 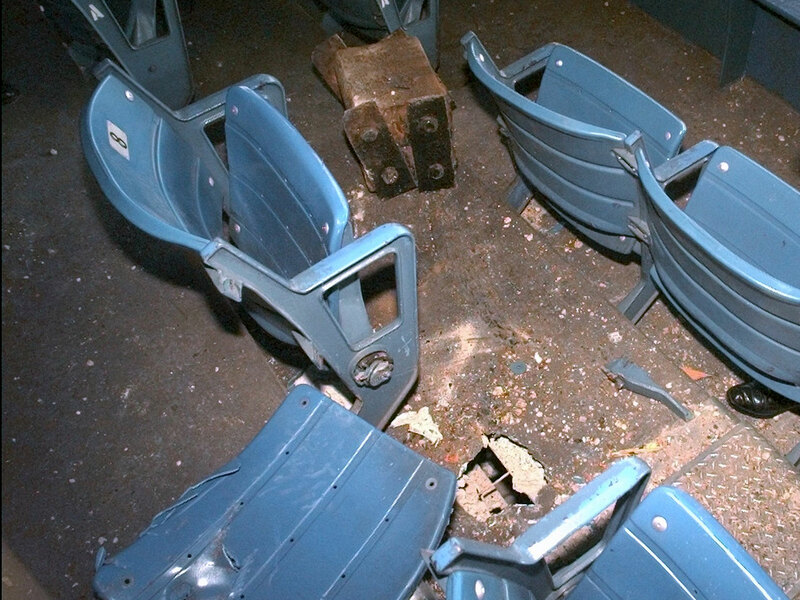 On April 15, 1998, the Yankees faced the Angels at Shea Stadium because an expansion joint had fallen from a ceiling in Yankee Stadium two days earlier, causing the cancellation of games on both days and leading to an investigation of the structural soundness of the 75-year-old ballpark. Dressing at Yankee Stadium before busing over to Shea for a noon start was yet another twist in what had already been a strange season for New York. The club started the year dropping four of its first five games, leading to speculation about manager Joe Torre's job security, but had won five straight when they arrived in Queens. The Yankees jumped out early against Anaheim starter Ken Hill, scoring two first-inning runs. They added another in the third and two more in the fourth, and in the fifth inning Darryl Strawberry did what he had done 126 times before at that ballpark: hit a home run. That solo shot was one of three hits for the longtime Mets star in his old stadium, making him the star of the Yankees' 6-3 win. Later that night, the Mets beat the Cubs 2-1 to cap an unusual doubleheader. The Yankees went on the road and won five of six before returning to the Bronx on April 24. By then, they were well on their way to a record 125-win season and the franchise's 24th World Series championship.